Luxurious cabin away from it all, yet close to everything! Private and luxurious cabin situated on 15 acres with Little Elk Creek running through it, and a small pond just steps away from your door. Perfect for a relaxing getaway! Newly remodeled, inside and out! Huge bedroom with comfy king size bed complete with DIVINE Boll & Branch bed linens! Large bathroom with granite vanity, waterfall sink and walk-in shower. Open kitchen/living area with huge windows to take in the breathtaking views in every direction. All new stainless steel appliances, granite countertop and nicely appointed kitchen with all of the amenities. Huge deck on two sides with seating areas, dining table with umbrella and new Weber gas barbecue grill for your outdoor enjoyment. This beautiful cabin is wheelchair accessible with a ramp leading up to the deck, extra wide doorways and seating in shower. There is also a queen-size hide-a-bed in the living area which is perfect for two children. A fire pit is just steps away, for making s'mores and stargazing! New large 4G flat screen satellite TV and blue ray DVD player for your viewing enjoyment. This cabin is THE place to get away from it all, relax in luxurious comfort and revitalize your body and spirit! A double Caribbean hammock hung between two old oak trees is the ideal spot to take a nap while communing with nature! Wildlife abounds in this area! You will see deer, wild turkey, bald eagles, elk and much more. The coyotes will serenade you from a distance every evening. We have several bird feeders and bird houses on the property. Mountain blue birds abound and will amaze you with their beautiful song and their brilliant blue color! In August of 1874 General George Armstrong Custer camped in this valley. You will be experiencing history! The book describing Custer's expedition is on the coffee table and is available for your enjoyment. History buffs will love it! With National Forest on three sides, this is also a great place for hiking and ATV-ing. Direct access to Kelly Spur Road which connects with over 3500 miles of ATV trails. We provide coffee, tea, flour, sugar and basic spices. The kitchen is equipped with plenty of dishes, silverware, glassware, pots, pans, utensils, crockpot, dish soap, napkins & paper towels. A brand new Maytag washer & dryer are available for your use. The all-new stainless steel appliances include refrigerator with ice-maker, five burner stove with oven, microwave & dishwasher. Granite countertops in both kitchen and bath. Plenty of thick, fluffy towels are provided, as well as soaps, and a hairdryer. We have high speed satellite internet and cable 4G TV. Cell service is very limited throughout the Black Hills. As you travel through the Black Hills, cell service will come & go. If you need to use a land line, we live on the adjacent property and are happy to let you use our phone. We are also available should you have any other needs. This is THE place to get away from it all and enjoy relaxing in the beautiful Black Hills! Check out the view from the king size bed! Wouldn't you like to wake up to that view??? However, if this rental doesn’t meet your needs, please check out our additional VRBO rental, #623074. We also invite you to “check us out” as owners by reading the reviews of our other property which has been listed on VRBO for several years. We're sorry, but unfortunately we do not allow pets and do not allow smoking. Also, bikers need to be aware that there is a one mile well-maintained gravel road leading to the property. If this is a problem for you, please contact us. We would be happy to have you park your bikes at our adjacent property, if you would like. Garage space is available for a nominal fee. We are outdoor enthusiasts, foodies, gardeners and outgoing people! We love to travel and almost always choose to stay at VRBO properties. We love meeting new friends like you! Luxurious cabin with everything you could possibly need in the most peaceful setting you can imagine! Away from it all, yet close to everything! Very private with the most amazing views you can find! Close to everything...Mt. Rushmore, Crazy Horse, Deadwood and Spearfish are just minutes away. POSH cabin with Boll & Branch bed linens, granite counter tops and all-new appliances. Situated on 15 acres surrounded by the Black Hills National Forest. Who could ask for more? Luxurious Boll and Branch sheets and blanket! Satellite internet. May be affected by severe weather. Bandwidth is not suitable for streaming. Lots of fluffy towels provided for your use. Five burner smooth top range with self-cleaning convection oven. We provide filters and coffee! Coffee, coffee filters, tea, flour, sugar, vegetable oil, salt, pepper, Montreal Seasoning, garlic salt, napkins, & paper towels. Dishes, silverware, glassware, pots, pans, utensils and bakeware. Granite countertops, all-new stainless steel appliances, built-in ice maker, dishwasher and staples provided. 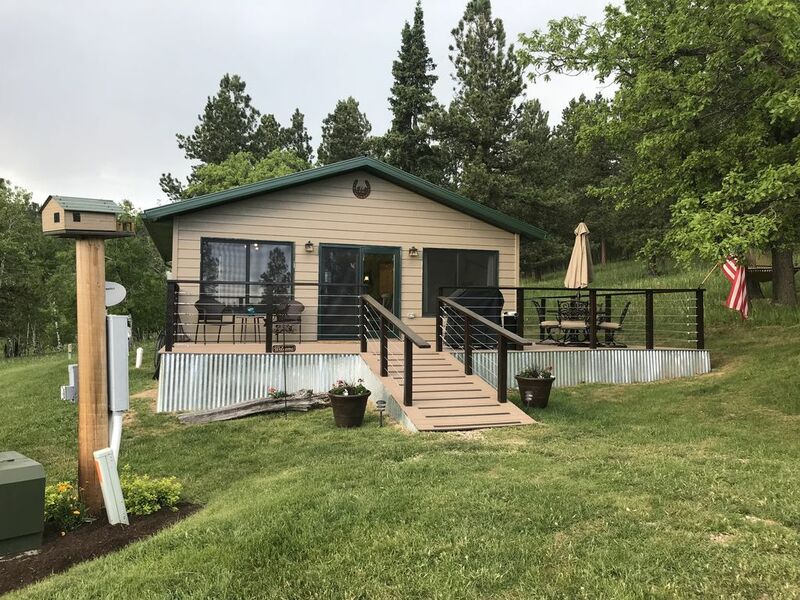 Wheelchair ramp to access cabin, extra wide doorways, low entry door handle/lock, smooth floors/transitions, and open shower (with slight lip entry) and built-in seating. Clean, quiet and comfortable. Owners responsive to all needs and are genuinely concerned with your comfort. I would definitely stay again and can't wait to come back! Cabin is newly remodeled. Fully stocked with anything you could possibly need and great location. Misty Haven was the perfect place my wife and I to celebrate our anniversary. We rode atv's during the day and grilled out while relaxing on the deck at night. Margaret even brought us a bottle of wine as an anniversary gift. Cabin proved to be more than we expected. Can't wait to return next year. Thank you, Nick! You guys were awesome guests and we hope that you will visit Misty Haven again! What a cozy cabin! Couldn’t be more pleased with our choice. The cabin had everything we needed and more. It is so well maintained and clean! Loved being in the hills...close enough to our desired sites but far enough to feel the peace and smell the land. Hearing the coyotes and grandkids echo across the hills was amazing. The kids loved feeding the lil chipmunks. We will definitely be back! Thank you so much! We are so happy that you enjoyed your stay at Misty Haven! We would love to have you visit again, and the boys need to do some fishing next time. Thank you again for staying with us! Perfect location for Sturgis Bike Week. Clean, quiet and comfortable. The Pasta Coral was an added bonus. The amenities, cabin condition made our trip perfect! Thank you so much! You guys were awesome guests! We hope to see you again for Rally, but you should also bring your wives to experience the beautiful Black Hills! Clean, relaxing, and great location to all major South Dakota attractions!!!! We had the best time! Margaret and Derito were amazing hosts! Our kids loved fishing on their property and we even got to try some smoked trout, prepared by Margaret and Derito, caught fresh from the pond! The house was perfect for the four of us and the scenery was gorgeous. We loved roasting marshmallows and relaxing by the fire pit each night. The location was perfect and all the major attractions were just a short, scenic drive away! If your looking for a clean, relaxing, and quiet property...this is where you want to be! Thank you again!!! Jessica, thank you so much for staying with us and for your kind review! Your family is delightful and we truly enjoyed getting to know you! We hope you will come and visit us again, maybe for a spring break getaway sometime. Beautiful, clean, quiet, and perfect! The pictures of the property are terrific but they don't do it justice. When my wife and I drove up to the property we were immediately treated with 15 acres of beautiful lush grounds - trees, animals, and picturesque views. The house is perfect and has everything you need for a quiet getaway. We read in the hammock, barbecued, watched movies, traveled to close-by destinations like Mt. Rushmore, Crazy Horse, Sturgis, and Deadwood. We rode ATV's, went fishing at Pactola Lake. Our host, Margaret, was absolutely terrific. She came by for a quick visit to ensure our stay was perfect - and even brought homemade pasta for us to enjoy. We have never had a better rental experience. We will be back! Mark, thank you so much! It was a pleasure meeting you & your wife. We're so glad that you enjoyed our little slice of paradise. We sincerely hope to have you visit again!